Eberle, Jaelyn J.. "Ellesmere Island Eocene Fossils". The Canadian Encyclopedia, 04 March 2015, Historica Canada. 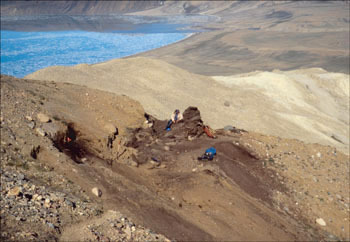 https://www.thecanadianencyclopedia.ca/en/article/ellesmere-island-eocene-fossils. Accessed 20 April 2019. Having been mapped on foot, by dogsled, and from the air by rugged geologists from the GEOLOGICAL SURVEY OF CANADA, the Canadian High Arctic was untouched by vertebrate palaeontologists until the mid-1970s. Some 55 million years ago, during the early Eocene Epoch, ELLESMERE Island in Canada's eastern High Arctic was warm and ice-free. It was also home to lush lowland forests and swamps inhabited by alligators, giant tortoises, snakes, lizards, and a host of mammals that included primates, tapirs, hippo-like Coryphodon, and large, rhino-like brontotheres. In the nearby ocean, clams and snails thrived. This extinct environment, well above the ARCTIC CIRCLE, combined a warm temperate climate with a typical Arctic light regime of bright summers and dark winters. Having been mapped on foot, by dogsled, and from the air by rugged geologists from the GEOLOGICAL SURVEY OF CANADA, the Canadian High Arctic was untouched by vertebrate palaeontologists until the mid-1970s. The first discoveries of Eocene vertebrate FOSSILS on Ellesmere Island were made in 1975 by Mary Dawson and Robert (Mac) West, vertebrate palaeontologists at the Carnegie Museum of Natural History and Milwaukee Public Museum, respectively. 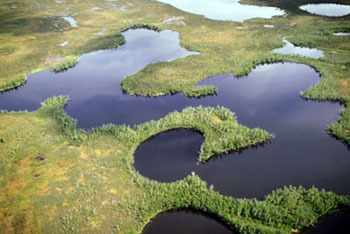 In rocks of the Eureka Sound Group near the head of Strathcona Fiord (~78º N lat), the duo discovered fossils of alligators, fishes, turtles, and mammals. Ranking among the greatest contributions to vertebrate PALAEONTOLOGY of the last century, these first discoveries confirmed beyond anyone's doubt that the High Arctic had enjoyed a mild temperate climate millions of years ago, and sparked decades of Arctic palaeontological field exploration. Finding fossils on Ellesmere Island is no easy feat. The stark, unmarred beauty of the landscape is matched only by the harshness and unpredictability of Mother Nature. While the 24-hour-daylight afforded by the Arctic summer may sound idyllic, it makes sleeping difficult, and blue sky and sunshine are often countered by clouds, fog, and the cold winds off the fiords that cut straight to the bone. When the thermometer goes up and layers of fleece and protective outerwear are shed, hungry mosquitoes lie in wait. Furthermore, fossil bones and teeth are few and far between, and the PERMAFROST wreaks havoc on them. Left are but pieces of an Eocene puzzle, that, if complete, would probably look a lot like today's cypress swamps teeming with life. From a palaeogeographic perspective, the High Arctic has long been considered as en route for extinct land mammals dispersing between North America and both Europe and Asia. Early Eocene fossil mammals from Ellesmere Island support the existence of a North Atlantic land corridor between northern Europe and North America because several of the mammalian genera are shared with early Eocene North American and European faunas. Moreover, a high-latitude land bridge existed across the Bering Strait between Asia and North America for much of the Cenozoic Era (approximately the last 65 million years) and, as a result, many mammal lineages are thought to have dispersed back and forth between these two continents. For example, the oldest and northernmost tapirs, known from fossil bones and teeth from Ellesmere Island, suggest close links to both Asian and North American fossil tapirs. The Eocene fossil animals and plants preserved in rocks on Ellesmere Island comprise a striking example of a high-latitude "greenhouse" world during the warmest interval in all of Cenozoic time. New paleoclimate studies indicate that Mean Annual Temperatures (MAT) on Ellesmere Island during the early Eocene probably ranged from about 10 to 12 ºC, a far cry from today's MAT of about -20 ºC. As our concerns about today's GLOBAL WARMING are heightened, the fossils of Ellesmere Island will play an ever-important role in our understanding and ability to predict the future impacts of global warming on Earth's life and environments. See alsoPALEONTOLOGY; FOSSIL ANIMALS; FOSSIL PLANTS; ELLESMERE ISLAND PLIOCENE FOSSILS.